LightSail captured this image of its deployed solar sails in Earth orbit on June 8, 2015. The Planetary Society's impressive solar sail experiment has re-entered Earth's atmosphere, ending a successful test flight that sets the stage for an even more ambitious mission in 2016. Called LightSail-A, the solar sail prototype launched into space on May 20 aboard an Atlas V rocket that also carried the U.S. Air Force's secretive X-37B space plane into orbit. LightSail-A was packed inside a tiny cubesat satellite and unfurled its shiny solar sail on June 7. Patch of the Planetary Society’s LightSail experiment. "A complete image of the spacecraft's solar sails was downloaded on June 9, confirming the mission's primary objective of sail deployment had been met. 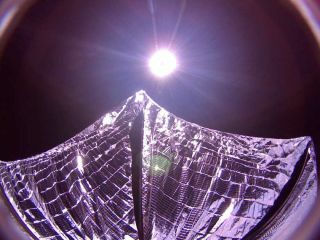 But before engineers could get a picture from the opposite-side cameras, LightSail's radio began transmitting a continuous, nonsensical signal, and the spacecraft stopped responding to commands," Davis explained. For the LightSail-A mission, mission operations were conducted at Cal Poly, San Luis Obispo, the prime ground station that commanded the spacecraft. A large enough sail would provide thrust from the pressure of sunlight, with no need for fuel. See how solar sails work in this Space.com infographic. Satellite watcher, Ted Molczan in Canada, told Inside Outer Space that the sail's decay was near 55 S, 32 W – about 2,800 miles (4,500 kilometers) east of the Falkland Islands. Molczan said that orbital analysis reveals that with the spacecraft deploying its solar sails, the craft rapidly spiraled toward its demise. "For an object to descend from orbit so rapidly may seem non-intuitive, but it was due to LightSail-A's large ratio of surface area to mass, which was 500 to 1,000 times that of typical spacecraft and rocket bodies," Molczan said. What's ahead is a follow-on solar sailing test flight now slated for late 2016. According to Mitchell Walker of Georgia Tech, LightSail-B will be packaged within Prox-1, now targeted for a September 2016 liftoff on the Space Test Program-2 (STP-2) mission on a SpaceX Falcon Heavy booster. LightSail-B will be deployed from Prox-1 once on-orbit, Walker told Inside Outer Space. The Prox-1 mission will demonstrate automated trajectory control for on-orbit inspection of a deployed CubeSat. The Prox-1 spacecraft has been designed, fabricated and tested by a team of Georgia Tech undergraduate and graduate students who will also be responsible for mission operations. LightSail mission control team at Georgia Tech, from left, undergraduates Christopher Pubillones, Nick Zerbonia, Teresa Spinelli, Kevin Okseniuk, and Professor David Spencer. The Prox-1 will deploy The Planetary Society's LightSail solar sail spacecraft. Prox-1 will fly in close proximity to the LightSail, demonstrating automated trajectory control based upon relative orbit determination using infrared imaging. Visible images of the LightSail solar sail deployment event will be acquired and downlinked by Prox-1. The Prox-1 mission will also provide first-time flight validation of advanced Sun sensor technology, a small satellite propulsion system, and a lightweight thermal imager. The mission is funded by the Air Force Office of Scientific Research, through the University Nanosatellite Program. Leonard David has been reporting on the space industry for more than five decades. He is former director of research for the National Commission on Space and is co-author of Buzz Aldrin's 2013 book "Mission to Mars – My Vision for Space Exploration," published by National Geographic, with a new updated paperback version to be released in May. Follow us @Spacedotcom, Facebook and Google+. Story published on Space.com.